For millions of Americans, the first few days of 2014 have proven to be the coldest they’ve ever experienced. The Midwest, Northeast, and Southeast have seen uncommon frigidness and record-low temperatures due to a distorted polar vortex. A polar vortex is the circulation of strong, cold air that is typically settled near the planet’s north or south poles. This particular vortex became distorted and traveled south after detaching from the North Pole, bringing severe Arctic winds with it. 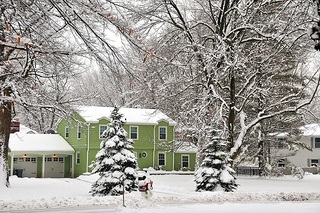 As a result, much of the U.S. has been enveloped in a deep freeze for several days. Fortunately, the worst of the extreme weather seems to have passed, as conditions in the Midwest and East are expected to improve throughout the week. Between Monday, January 6 and Tuesday, January 7, however, the regions affected by the polar vortex experienced some of the coldest weather they have seen in the last 20 years. To find the cities most affected by the polar vortex, we looked at the difference between historical average low temperatures (in degrees Fahrenheit) for Jan. 6-7 and this year’s lows for the 50 largest cities in the U.S. 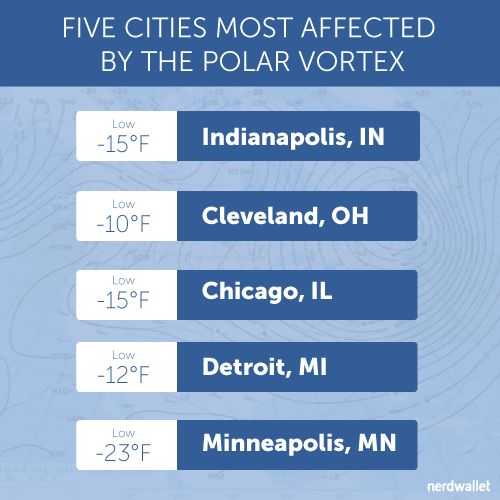 The resulting list reveals that the Midwest has been affected the most and that the results of the polar vortex have been felt as far west as Colorado and as far south as Texas. The Midwest has experienced the worst of the severe weather and people in Indianapolis have been affected the most in terms of a drop in temperature from historical averages. Temperatures are expected to rise after a low of -15 degrees on Monday, but resources are still available for those without refuge from the cold. The American Red Cross has opened more than a dozen shelters in Central Indiana, including one at its office in 41 E. 10th St. in Indianapolis. Moreover, The Salvation Army has opened an overnight shelter at Eagle Creek Community Center for those without power. The subzero temperatures seen in Cleveland this week were the lowest in 10 to 15 years, increasing the need for shelters and assistance to the homeless. Nonprofit organizations such as Joseph’s Home and the West Side Catholic Center provide year-round resources for those in need. Several other establishments in Cleveland also provide emergency assistance for people who need shelter from the cold. Residents of Chicago may be used to cold weather, but the polar vortex has brought about a level of frigidness even they are not accustomed to – Monday morning’s low of -15 degrees broke the city’s previous record low for January 6th. There are several warming centers located throughout the city for those without heat or in need of shelter, including police stations that are open 24 hours a day. Detroit also experienced record-breaking low temperatures on January 7, causing at least 6 deaths. Detroit Rescue Mission Ministries (DRMM) is one of several organizations extending their services to help those in need. DRMM is providing emergency shelter at three different locations, allowing homeless to stay in its shelters for a longer period of time until weather conditions improve. Monday’s low temperature of 23 degrees below zero was the lowest Minneapolis has seen in a decade. If severe weather conditions continue to persist, people can seek refuge from the cold at The Salvation Army’s Harbor Light Center in downtown Minneapolis, which has been exceeding its capacity by setting up cots and chairs in addition to its beds to help the large number of people in need. Temperature data was acquired from AccuWeather.com.